Arrived safely early in the morning on monday and headed via metro to our beautiful hotel. A long lunch at pottery cafe then a couple of hours in the Egyptian museum, the highlight being the Tutankhamen exhibit, including the death mask. 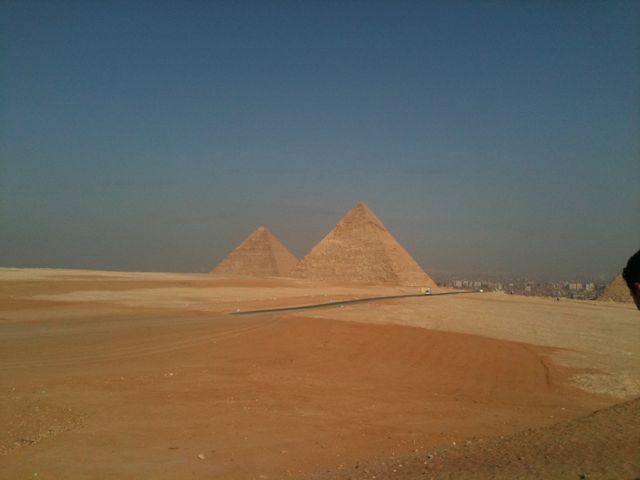 Tuesday was spent admiring the pyramids. We felt very proud of ourselves after having navigated our own way there by bus. We also trekked to the Giza plateau for photo opportunities without the assistance of a vehicle or animal! We’re definitely benefitting from the cooler temperatures of Cairo, which we estimate to be a very pleasant and comfortable 30 degrees. 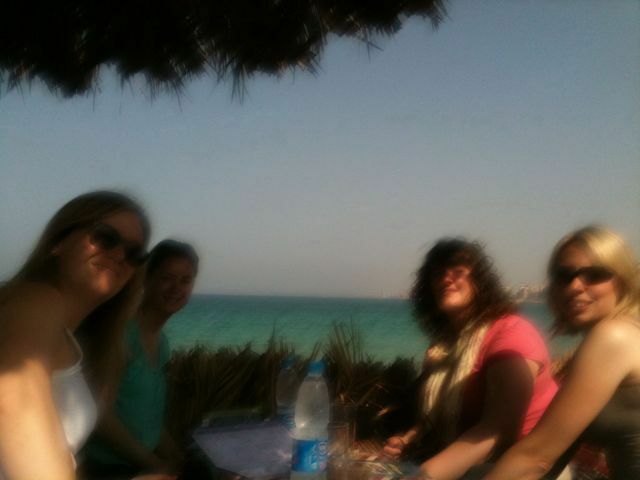 Wednesday; a day beside the sea in Alexandria! 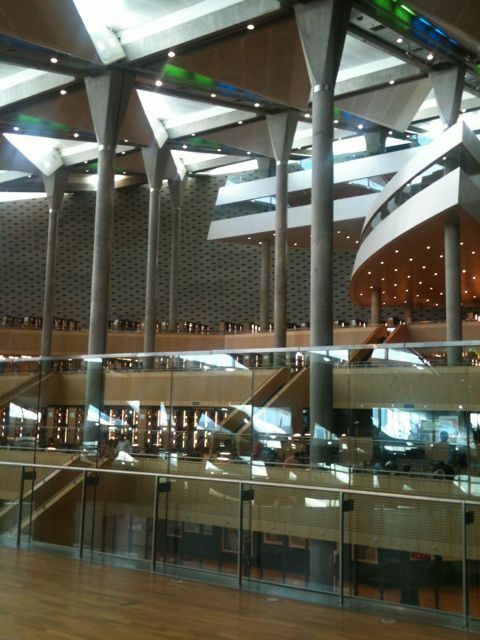 A visit to the library, which took 17 years to build at a cost of $355 million. The library’s architecture aimed to revive the legendary “mother library” of antiquity. Pictograms, hieroglyphs and letters from every alphabet are carved on the exterior to evoke the diversity of knowledge embodied in the ancient library and the aspirations of the new one. Dinner was of course fish and chips! Thursday; we finally met Nesirin this morning, the international commissioner here who organised our trip. We also met the head of the Egyptian Guide Association. They were very keen to hear about our experiences here. We also briefly met a group of rangers so it was out again with old faithful, edelweiss and ram sam sam. It’s amazing how quickly you can make friends with a smile and a sing song! After our brief visit to the federation we were taken to a scout celebration which was held to mark the end of a water purification project they have been working on. Again our celebrity status required a conversation with the press and many photographs! We spent the afternoon shopping in the fabulous bazaar in islamic Cairo, Khan al-khalili, which offered a vast array of beautiful things to buy, it seemed quite different from the Souqs we had experienced so far! We wandered through Islamic Cairo to take in the architecture and the atmosphere and then walked back through the hustle and bustle of the ‘real Cairo’: street vendors jostling with cars and pedestrians, selling everything you can imagine, with the smells of corn on the cob, sweet potatoes and popcorn emanating from various carts. Not another tourist in sight, just the 5 of us, in uniform! Our last night together was at Zamalek, by the Nile. A luxurious suburb of Cairo where we went to L’aubergine for our last meal, a delicious selection of delicacies that seemed to bridge the gap between English and Egyptian fare. With project over our last few days in Aswan have been holiday. Sunrise visit to Abu Simbel on Friday. Great atmosphere of tourists and the dancers from the carnival. So many people the buses travelled in convoy, 4 hours folded in to a seat with nowhere to rest our heads. Saturday; morning visit to Edfu, temple of Horus and sister temple to Dendara. Cinema at 6 to see film chosen by Mr Abdulla’s son. Plastic school chairs are the cheap seats and fold down seats at the back with fans. Evening was spent by the Nile hosted by Marwa and Esra on behalf of the association. Temperature has dropped and is now very pleasant, apparently we have had up to 50 degrees over the course of the week. Sunday; chill out day by the pool. Then sleeper train to Cairo. Full entourage from the Association to wave us off, memorable. Aswan botanical gardens reached by boat in the morning. The island was given to Lord Horatio Kitchener in the 1890′s when he was commander of the Egyptian army. He turned the island in to a botanical garden, importing plants from the Far East, India and parts of Africa. We returned from the island via felucca and viewed the Nilometer which was used to measure the water level of the river to determine the taxes. The higher the level, the better the harvest and the higher the tax! Training was leadership interspersed with communication. Less girls today and only 2 brownies so it was much easier to run. 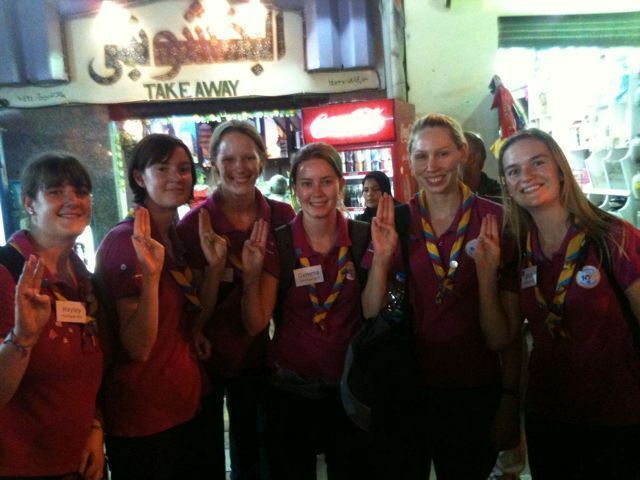 After training we were taken to the house of a friend of one of the guides for henna tattoos. A morning visit to a school for deaf and mute children followed by a school for children with learning difficulties. Afternoon on Internet then Aswan Moon restaurant for lunch. I had the Lonely Planet recommended daoud basha (meatballs). Delish! Training was Self Esteem. About 50 trainees attended and 12 Brownies – logistical nightmare in far too small a space so Sarah Kate and Gemma took the brownies in to a separate room to run a related but more age appropriate programme. The session ran more smoothly without the younger ones, and as Helen said, the 2 weeks of practice meant that we could run the activities smoothly enabling us to cope with the numbers more efficiently. The brownies engaged well and performed cheers and learned ram sam sam. 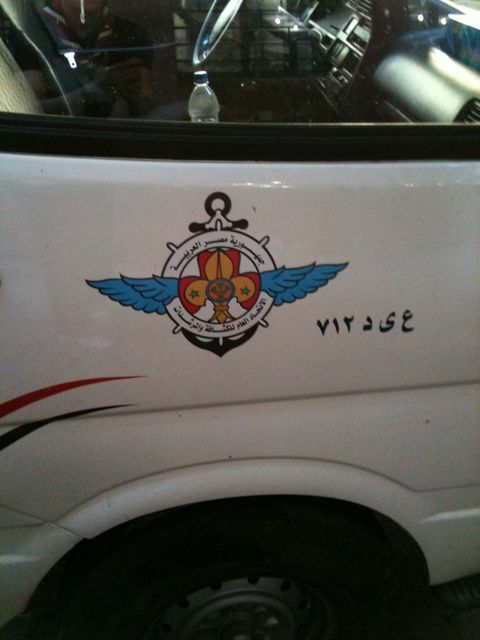 They attend a French school so communicating with them became an interchangeable mix of French, Arabic, and English. MacDonalds for tea, on our own. Hayley, Sarah and I had another animal kingdom incident. We’ve had a small lizard in our room since we moved in. Asked the man who came to look at our air con to remove it. The incident involved a slipper and lizard jam! The day started with a hotel move. As seems to be the way here the middle of the day was ours. It’s so hot that even the locals don’t want to be outside in the midday sun. So we seized the opportunity for some swimming! A refreshing dip in the pool of a nearby hotel by the Nile, wonderful! After takeaway pizza for lunch we attended our first training. An entirely different experience from previous weeks. We started the session with 31 trainees and by the end had about 40. A mixed age range from Brownies upwards. Discussion of expectations revealed that most of the girls are already involved in Guiding in some way and some of them are keen to become leaders, so on paper our perfect target audience. The number of people and the vast age range complicated matters though, as did the acoustical difficulties of the hall. It was also hard to engage the ‘grown ups’ in some of the activities, which meant that things took a long time to organise. There aren’t any suitable tables for group work in the room either, which may make some of the games a challenge as the week progresses.